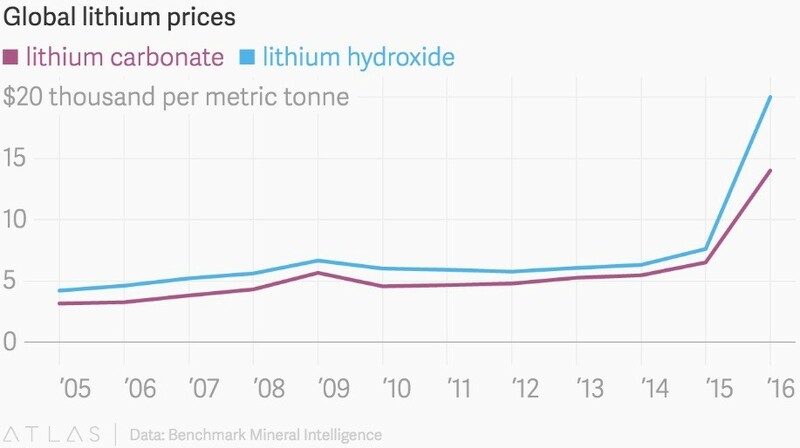 Now the same thing is happening with lithium, with two recent reports coming up with predictions of a slide in lithium prices due to a glut of new supply overwhelmingly the tiny (by mining's standards) lithium market. What is puzzling is that both of these reports either gloss over or fail to adequately break down the demand side of the lithium market – something we at Ahead of the Herd did some time ago in a separate article. The conclusion we came to was that lithium demand is skyrocketing, and will continue to do so in coming years, due to the irreversible trend of moving from internal combustion engine-powered vehicles to electric vehicles. The trend is particularly evident in Asia. China is the largest EV market by volume, while Japan is number three behind the US. India is also aggressively ramping up EV targets. Of course we've seen the demand scenario play out through lithium prices, which have doubled in the last two years and are current trading at around $23,000 a tonne for battery-grade lithium carbonate. Still, the lithium bears are coming out from hibernation, and lithium stocks have been taking it on the chin. This article will show why they're wrong. 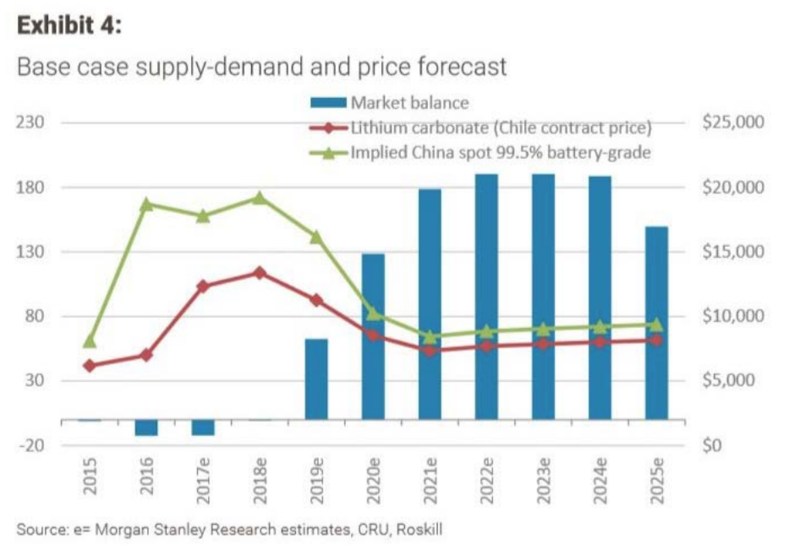 The main reason for Morgan Stanley's argument for oversupply was the recent government approval in Chile for mine expansions which would “open up the floodgates” to new lithium product. That is referring to a deal struck in January between Chilean development agency Corfu and SQM, Chile's largest lithium producer, over lithium royalties in the Salar to Atacama, one of the largest and highest-grade lithium deposits in the world. The deal frees SQM to boost its production quota in exchange for higher royalty rates equivalent to those paid by competitor Albemarle. It also permits SQM to work with state copper miner Codelco to start developing the Maricunga lithium deposit – the second largest lithium-bearing salt brine deposit in Chile. 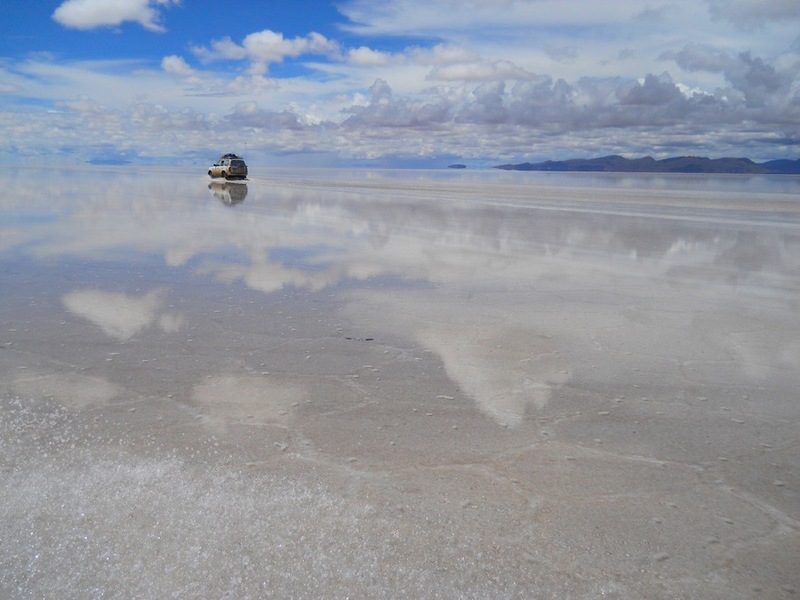 In all the agreement allows SQM to produce up to 216,000 tonnes of lithium carbonate a year from the Salar de Atacama. Lithium supply could also increase due to the election of a new president in Chile, Sebastian Piñera, whose National Renewal Party is open to revisiting a law prohibiting lithium production above 80,000 tonnes. What the bears seem to have in common is the belief that a rush of new lithium supply will soon hit the market, but what the analysts don't realize, or maybe for their own reasons neglect to mention, is that a lot of these mines will fail to deliver. The country has signed lithium offtake agreements with mines in Australia, Canada and Africa, and despite Tianqui Lithium – which owns 51% of Talison's Greenbushes mine in Australia, the largest hard rock lithium mine in the world – being recently denied a 32% ownership stake in SQM, China isn't giving up. Other Asian companies, such as Japan's Panasonic and Korean conglomerate Samsung, are also looking to ink deals in the lithium triangle of Chile, Argentina and Bolivia. A million electric cars produced in North America means 45,454,000 kg/ 100,000,000 pounds or 45,454 tonnes /50,000 tons of lithium carbonate equivalent (LCE) has to be mined just for Tesla’s North American electric vehicle production – and Tesla has promised to source North American lithium. Elon Musk, Tesla’s CEO, also has plans to build four more Gigafactories other than the one currently being built in Nevada. And it's not just about the US. China is also building lithium-ion megafactories, and by 2020 these are expected to grow global production capacity by six times. “Lithium is coming of age in a big way. 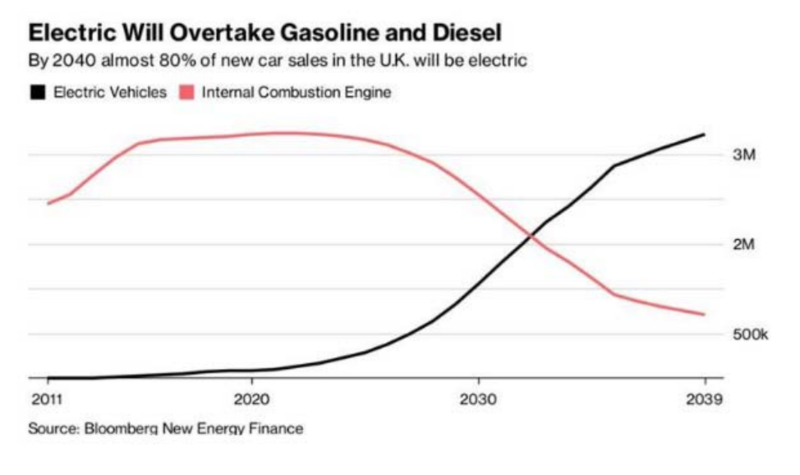 It's the core ingredient to 99 percent of electric vehicles and as a result, demand is going through the roof,” Simon Moores, managing director at Benchmark Mineral Intelligence, a UKbased battery metals consultancy, told CNBC. Another key point is that analysts tend to lump all potential lithium production together, including producers, near-term producers, brines, hard rock mines, and lithium sucked from oilfield brines. The forecasts vastly underestimate the difficulty in extracting lithium from spent oilfields, for example. Some of these wells are up to four kilometers deep, the brine needs to be pumped and trucked to a storage site, then the lithium has to be separated from all the other impurities which could include uranium, thorium, magnesium and potash. It's neither an easy nor a cheap process and no company has yet been able to do it on a commercial scale. This slide is fascinating for a couple of reasons. 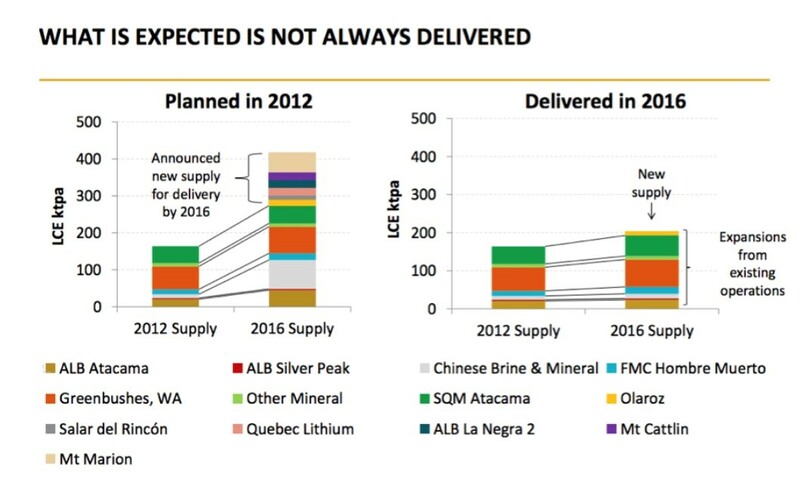 One, it proves, like the title, that “What is Expected is Not Always Delivered.” In other words, the major lithium miners despite their best efforts to double production in four years, were unable to do so. Why not? It can't have been due to prices, which, as seen in the chart below, started heading higher in 2015. As far as we know there weren't any government policies restricting demand in the producer countries during this period so the only explanation must have been technical challenges in getting the lithium to market. 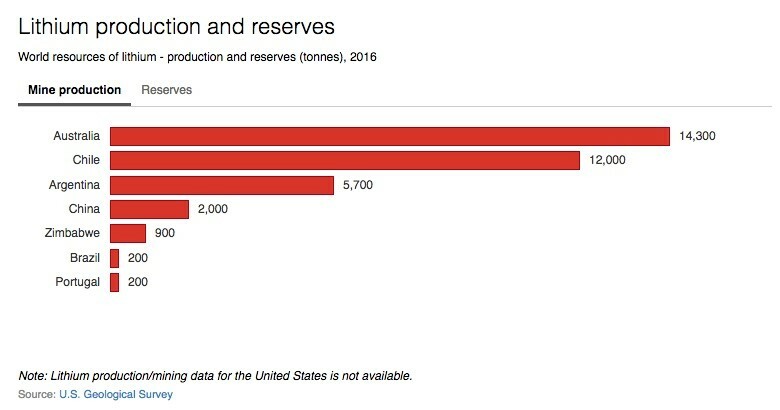 The second reason we love this chart is because it shows definitively how vulnerable the United States is to foreign imports of lithium carbonate especially considering Tesla's often-stated goal that it plans to source the lithium for its EV batteries from North American mines. The country currently imports most of the lithium that it consumes – with import reliance today pegged at greater than 70%. On the left of the chart notice the red square denoting Albemarle's Silver Peak mine – the only producing lithium mine in the United States. We know that Silver Peak has the capacity to produce 6,000 tonnes of LCE per year. They delivered it in 2012 but what happened in 2016? The mine is missing from the right side of the chart, meaning that Silver Peak, located about 200 miles from Tesla's Gigafactory, failed to produce any new supply to the market. Why not? If Silver Peak can't deliver any additional lithium in four years, how can it possibly be expected to supply Tesla's lithium needs, which as we calculated above, would be 50,000 tonnes of LCE by 2020 if a million Teslas come out of its factory? Let alone four more gigafactories and lithium needed for electric batteries in the Chevy Bolt – the second-best selling EV in the US last year behind Tesla. EV sales in the US, by the way, were up 25% last year compared to 2016, making it the best year ever – giving more ammo to the demand argument. According to Benchmark Intelligence, Tesla's Gigafactory also needs about 24,000 tonnes of lithium hydroxide annually, out of a global market of around 50,000 tonnes. Like lithium carbonate, lithium hydroxide is a key raw material for EV battery cathodes. Given the dearth of current US production, Tesla is looking to Chile to source its lithium, and is reportedly in talks with SQM about possibly building a processing plant. The reason is simple. North American lithium mines are currently too small, not far enough developed, and do not produce a unified product that can easily feed into a supply stream. Tesla would have to go to dozens of different mines for its lithium carbonate and lithium hydroxide. Such a fragmented supply line just isn't practical. The old adage, to find a mine, look around a mine, applies here. As mentioned Albemarle's Silver Peak mine is the only producing lithium mine in the US, but there are other properties around Silver Peak that could become the next big producer and be the solution Tesla has been looking for. Currently Tesla has an agreement with Pure Energy Minerals to supply lithium hydroxide. Pure Energy's lithium brine project is located in Clayton Valley adjacent to the Silver Peak mine. It has an inferred resource of 218,000 tonnes of LCE according to an NI 43-101 report filed in August, 2017. Pure Energy has calculated in a preliminary economic assessment annual production of 10,300 tonnes lithium hydroxide or 9,100 tonnes lithium carbonate equivalent (LCE). Let's revisit those Tesla LCE requirements. At a million vehicles a year Tesla needs 45,000 tonnes of LCE, meaning Pure Energy can supply just 20% of that. According to the USGS, the United States can only claim about 203,000 tonnes of LCE reserves compared to 75 million tonnes of reserves found throughout the world. That's about the same amount of lithium currently being produced. But the States has much more lithium than that in the ground. US lithium resources (which include reserves plus lithium that can't yet be economically mined) currently stand at about 36 million tonnes of LCE, versus 217 million tonnes globally. That leaves a lot of lithium in the US, still to be converted from resources to reserves through exploration drilling. Fortunately there is a solution to the problem faced by Tesla regarding its current inability to source US lithium for its Gigafactory, which could also go a long way towards developing an electric vehicle battery industry in the US, while also significantly diminishing the currently 70+% dependence on foreign lithium imports. Three years ago Cypress Development Corp (TSX.V:CYP) began prospecting in the Clayton Valley, home to Albemarle's Silver Peak mine. Cypress wasted no time in acquiring two land packages: the 1,520-acre Glory Project totaling 76 placer/lode claims located in Esmeralda County, and the 2,700-acre (35 association placer claims) Dean Project. Drilling was conducted in 2017-18 and the company is currently waiting on its maiden 43-101 compliant resource report expected near the end of April. All eyes are on that maiden resource because it is expected to be BIG. Retail and institutional investors are starting to pay attention. The stock has risen nearly 60% over the last month. Recently Lithium X Energy (TSX.V:LIX) put out a news release updating investors on the takeover announced by the lithium explorer in December, by Chinese company Nextview New Energy Lion Hong Kong Ltd.
Lithium X's Sal de Los Angeles project in Argentina has an NI 43-101 resource of 1.04 million tonnes lithium carbonate equivalent (LCE) in the indicated category and 1.01MT inferred, for a total LCE resource of 2.05 million I&I tonnes. This news from Lithium X is extremely interesting, because we now know how much a larger company will pay for a lithium brine exploration property in Argentina with a battery-grade lithium resource. That number is fairly easy to calculate: take the buyout value of $265 million and divide it by the NI 43-101 Indicated and Inferred resource of 2 million tonnes lithium carbonate equivalent or LCE, and you get Cdn$132.50 a tonne. In other words, a tonne of LCE, in the ‘ground’ in today's hot lithium market is worth 132.5 loonies. Cypress is coming out with a 43-101 compliant resource report which will also have metallurgical tests and lithium recovery results. Let’s look at some of my numbers. CYP’s Clayton Valley Lithium Project in Nevada is, well there’s no other way to describe it other than eye-poppingly massive. My personal (and please remember these are my personal calculations, they are not from Cypress, are not 43-101 compliant and are not to be relied on for an investment decision), back-of-the-napkin resource calculation is 3,500 meters length X 2,000 meters width X 70 meters thick X 1.75 specific gravity (density) = 857,500,000 tonnes of lithium enriched claystone (approx. 4,500,000 tonnes of LCE). I get into more conservative, and ulta conservative numbers here, but the results are still pretty impressive. FMC, Albemarle, SQM and China’s Tianqi Lithium Corporation together, according to Wood Mackenzie consultant James Whiteside, accounted for 78% of the world’s lithium carbonate equivalent last year. SQM, the largest global LCE producer, plans to expand its lithium carbonate capacity in Chile to 63,000 tonnes in 2018. Australia’s Orocobre planns to produce 17,500 tonnes a year of lithium carbonate at its Olaroz facility in Argentina. If there are 4,500,000 tons of LCE on CYP’s Dean and Glory claims it would take SQM 71 years to mine it at 63,000 tons per annum, 2mt of LCE would take 31.7 years. Massive potential indeed. Let's return to that $132 a tonne buyout value ascribed to Lithium X. Nextview paid that for a brine-based lithium deposit in Argentina. Cypress has a non-hectorite claystone starting at surface deposit in Nevada, USA. No tariffs, no trade war worries, next to the only producing lithium mine in the US and in the home state of Tesla’s Gigafactory. Those with a surface knowledge of the lithium industry are being scared off by analysts who are writing reports showing that the lithium market is on the peak of a downturn due to an overabundance of the white metal. But more in-depth analysis shows that the supply-demand balance skews heavily towards the demand side which is still extremely bullish. Lithium supply forecasts must be weighed carefully, because most lithium mines will never make it into production due to the difficult technical challenges involved. The electric vehicle is upon us and it's not going away. While gas-powered cars will be around for some time, along with our oil-driven economy, the future is definitely going electric, and in some cases, autonomous – not only passenger vehicles but buses, municipal vehicles and semi-trucks. They will all require lithium-ion batteries in various combinations. Where will they get the lithium from? The “Big Four” – Chile, Argentina, Australia and China, is the easiest answer – but North America can also be in the mix if it chooses to. Where should we look to find more US lithium? How about right next to the only producing lithium mine in the United States – Albemarle's Silver Peak. Cypress Development Corp is developing a huge lithium deposit. We'll find out just how big within a very short time. Or the project could be bought out by Albemarle, which as we have shown, in four years was not able to add any new US based supply to the market. It seems to me that Albemarle could use a monster deposit such as Cypress has – making it an ideal takeout target. Consider this: Pure Energy, which like Cypress is in the Clayton Valley next to Silver Peak, has 218,000 tonnes inferred LCE. According to my numbers, and again these are from my calculations not Cypress, at an ultra-conservative estimate of 2 million tonnes LCE, that's close to 10 times as much lithium in the ground. Remember that Lithium X buyout figure of $134 per tonne? Multiplying that by 2 million tonnes gives a value of $268 million. The stock is currently trading at 38.5 cents, at a market cap of $21 million, meaning that, imo, CYP is obscenely undervalued. But let's wait and see till the maiden resource comes out. When was the last time you saw a junior resource company that might. make such a huge impact on the world’s largest lithium (or any metal), miner’s bottom line? These kind of opportunities just don’t come along very often. I have Cypress Development Corp, and what could be the biggest junior mining story of the year on my radar screen. Do you?